The name "crack" first appeared in the New York Times on November 17, 1985. Within a year more than a thousand press stories had been released about the drug. In the early 1980s, the majority of cocaine being shipped to the United States was landing in Miami, and originated in the Bahamas and Dominican Republic. Soon there was a huge glut of cocaine powder in these islands, which caused the price to drop by as much as 80 percent. Faced with dropping prices for their illegal product, drug dealers made a decision to convert the powder to "crack", a solid smokeable form of cocaine, that could be sold in smaller quantities, to more people. It was cheap, simple to produce, ready to use, and highly profitable for dealers to develop. As early as 1981, reports of crack were appearing in Los Angeles, Oakland, San Diego, Miami, Houston, and in the Caribbean. Initially, crack had higher purity than street powder. Around 1984, powder cocaine was available on the street at an average of 55 percent purity for $100 per gram (equivalent to $240 in 2018), and crack was sold at average purity levels of 80-plus percent for the same price. In some major cities, such as Los Angeles, San Francisco, New York, Philadelphia, Baltimore, Houston and Detroit, one dose of crack could be obtained for as little as $2.50 (equivalent to $6.03 in 2018). According to the 1985–1986 National Narcotics Intelligence Consumers Committee Report, crack was available in Los Angeles, New Orleans, Memphis, Philadelphia, New York City, Houston, San Diego, San Antonio, Seattle, Baltimore, Portland, Pittsburgh, Cleveland, Cincinnati, Detroit, Chicago, Minneapolis-Saint Paul, Milwaukee, St. Louis, Atlanta, Oakland, Kansas City, Miami, Newark, Boston, San Francisco, Albany, Buffalo, and Dallas. In 1985, cocaine-related hospital emergencies rose by 12 percent, from 23,500 to 26,300. In 1986, these incidents increased 110 percent, from 26,300 to 55,200. Between 1984 and 1987, cocaine incidents increased to 94,000. By 1987, crack was reported to be available in the District of Columbia and all but four states in the United States. Some scholars have cited the crack "epidemic" as an example of a moral panic, noting that the explosion in use and trafficking of the drug actually occurred after the media coverage of the drug as an "epidemic". In a study done by Roland Fryer, Steven Levitt and Kevin Murphy, a crack index was calculated using information on cocaine-related arrests, deaths, and drug raids, along with low birth rates and media coverage in the United States. The crack index aimed to create a proxy for the percentage of cocaine related incidents that involved crack. Crack was a virtually unknown drug until 1985. This abrupt introductory date allows for the estimation and use of the index with the knowledge that values prior to 1985 are zero. [dubious – discuss] This index showed that the Northeast U.S. was most affected by the crack epidemic. The U.S. cities with the highest crack index were New York, Newark and Philadelphia. The same index used by Fryer, Levitt and Murphy was then implemented in a study that investigated the impacts of crack cocaine across the United States. In cities with populations over 350,000 the instances of crack cocaine were twice as high as those in cities with a population less than 350,000. These indicators show that the use of crack cocaine was most impactful in urban areas. States and regions with concentrated urban populations were affected at a much higher rate, while states with primarily rural populations were least affected. Maryland, New York and New Mexico had the highest instances of crack cocaine, while Idaho, Minnesota and Vermont had the lowest instances of crack cocaine use. Between 1984 and 1989, the homicide rate for black males aged 14 to 17 more than doubled, and the homicide rate for black males aged 18 to 24 increased nearly as much. During this period, the black community also experienced a 20–100% increase in fetal death rates, low birth-weight babies, weapons arrests, and the number of children in foster care. The United States remains the largest overall consumer of narcotics in the world as of 2014. A 2018 study found that the crack epidemic had long-run consequences for crime, contributing to the doubling of the murder rate of young black males soon after the start of the epidemic, and that the murder rate was still 70 percent higher 17 years after crack's arrival. The paper estimated that eight percent of the murders in 2000 are due to the long-run effects of the emergence of crack markets, and that the elevated murder rates for young black males can explain a significant part of the gap in life expectancy between black and white males. The reasons for these increases in crime were mostly because distribution for the drug to the end-user occurred mainly in low-income inner city neighborhoods. This gave many inner-city residents the opportunity to move up the "economic ladder" in a drug market that allowed dealers to charge a low minimum price. Crack cocaine use and distribution became popular in cities that were in a state of social and economic chaos such as Los Angeles and Atlanta. "As a result of the low-skill levels and minimal initial resource outlay required to sell crack, systemic violence flourished as a growing army of young, enthusiastic inner-city crack sellers attempt to defend their economic investment." Once the drug became embedded in the particular communities, the economic environment that was best suited for its survival caused further social disintegration within that city. 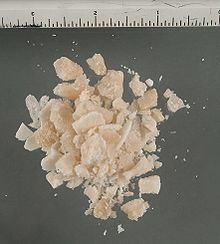 In 1986, the U.S. Congress passed laws that created a 100 to 1 sentencing disparity for the possession or trafficking of crack when compared to penalties for trafficking of powder cocaine, which had been widely criticized as discriminatory against minorities, mostly African-Americans, who were more likely to use crack than powder cocaine. This 100:1 ratio had been required under federal law since 1986. Persons convicted in federal court of possession of 5 grams of crack cocaine received a minimum mandatory sentence of 5 years in federal prison. On the other hand, possession of 500 grams of powder cocaine carries the same sentence. In 2010, the Fair Sentencing Act cut the sentencing disparity to 18:1. In the year 2000, the number of incarcerated African Americans had become 26 times the amount it had been in 1983. In 2012, 88% of imprisonments from crack cocaine were African American. Further, the data shows the discrepancy between lengths of sentences of crack cocaine and heroin. The majority of crack imprisonments are placed in the 10–20 year range, while the imprisonments related to heroin use or possession range from 5–10 years which has led many to question and analyze the role race plays in this disparity. Writer and lawyer Michelle Alexander's book The New Jim Crow: Mass Incarceration in the Age of Colorblindness argues that punitive laws against drugs like crack cocaine adopted under the Reagan Administration's War on drugs resulted in harsh social consequences, including large numbers of young black men imprisoned for long sentences, the exacerbation of drug crime despite a decrease in illegal drug use in the United States, increased police brutality against the black community resulting in injury and death for many black men, women, and children. According to Alexander, society turned into a racist criminal justice system to avoid exhibiting obvious racism. Since African Americans were the majority users of crack cocaine, it provided a platform for the government to create laws that were specific to crack. This was an effective way to imprison black people without having to do the same to white Americans. Thus, there was a discourse of African Americans and a perpetuated narrative about crack addiction that was villainous and problematic. The criminalizing of African American crack users was portrayed as dangerous and harmful to society. Alexander writes that felony drug convictions for crack cocaine fell disproportionately on young black men, who then lost access to voting, housing, and employment opportunities. These economic setbacks led to increased violent crime in poor black communities as families did what they had to do to survive. Alexander explains the process of someone who is caught with crack: first, the arrest and the court hearing that will result in jail or prison-time. Second, the aftermath of permanent stigmas attached to someone who has done jail-time for crack, like being marked a felon on their record. This impacts job opportunity, housing opportunity, and creates obstacles for people who are left with little motivation to follow the law, making it more likely that they will be arrested again. San Jose Mercury News journalist Gary Webb sparked national controversy with his 1996 Dark Alliance series which alleged that the influx of Nicaraguan cocaine started and significantly fueled the 1980s crack epidemic. Investigating the lives and connections of Los Angeles crack dealers Ricky Ross, Oscar Danilo Blandón, and Norwin Meneses, Webb alleged that profits from these crack sales were funneled to the CIA-supported Contras. Although Webb never claimed that the CIA directly aided drug dealers, it echoed the Kerry Committee conclusion that the CIA was aware of large shipments of cocaine into the U.S. by Contra personnel. The United States Department of Justice Office of the Inspector General rejected that there was a "systematic effort by the CIA to protect the drug trafficking activities of the Contras". The DOJ/OIG reported: "We found that Blandon and Meneses were plainly major drug traffickers who enriched themselves at the expense of countless drug users and the communities in which these drug users lived, just like other drug dealers of their magnitude. They also contributed some money to the Contra cause. But we did not find that their activities were the cause of the crack epidemic in Los Angeles, much less in the United States as a whole, or that they were a significant source of support for the Contras." Freakonomics (2005) – Chapter: "Why Do Drug Dealers Still Live With Their Moms"
^ a b c d e f g h "DEA History Book, 1876–1990" (drug usage & enforcement), US Department of Justice, 1991, USDoJ.gov webpage: DoJ-DEA-History-1985-1990. ^ a b Jim Abrams (July 29, 2010). "Congress passes bill to reduce disparity in crack, powder cocaine sentencing". Washington Post. ^ a b c Elsner, Alan (2004). Gates of Injustice: The Crisis in America's Prisons. Saddle River, New Jersey: Financial Times Prentice Hall. p. 20. ISBN 0-13-142791-1. ^ a b c "The Fair Sentencing Act corrects a long-time wrong in cocaine cases", The Washington Post, August 3, 2010. Retrieved September 30, 2010. ^ The word "street" is used as an adjective meaning "not involving an official business location or permanent residence" such as: "sold on the street" or "street people" in reference to people who live part-time along streets. ^ Beverly Xaviera Watkins, et al. "Arms against Illness: Crack Cocaine and Drug Policy in the United States." Health and Human Rights, vol. 2, no. 4, 1998, pp. 42–58. ^ Fryer, Roland G., et al. "Measuring Crack Cocaine And Its Impact." Economic Inquiry, vol. 51, no. 3, July 2013, pp. 1651–1681., doi:10.1111/j.1465-7295.2012.00506.x. ^ Fryer, Roland (April 2006). "Measuring Crack Cocaine and Its Impact" (PDF). Harvard University Society of Fellows: 3, 66. Retrieved January 4, 2016. ^ How bad was Crack Cocaine? The Economics of an Illicit Drug Market. Researched by Steven D. Levitt and Kevin M. Murphy . ^ The World Factbook. Cia.gov. Retrieved on 2014-05-12. ^ a b Evans, William N; Garthwaite, Craig; Moore, Timothy J (2018). "Guns and Violence: The Enduring Impact of Crack Cocaine Markets on Young Black Males". ^ Alexander, Michelle (2012). The New Jim Crow: Mass Incarceration in the Age of Colorblindness. The New Press. ISBN 1595586431. ^ a b c Peter Kornbluh (Jan–Feb 1997). "Crack, the Contras, and the CIA: The Storm Over "Dark Alliance"". Columbia Journalism Review. Retrieved February 10, 2008. ^ Viera, Bené (November 26, 2011). "'Planet Rock' Shows The Power Of Hip-hop". Reinarman, Craig; Levine, Harry G. (1997). Crack In America: Demon Drugs and Social Justice. University of California Press. ISBN 978-0520202429.